The Heron TP unmanned aerial vehicle is a new variant of Heron UAV. Image courtesy of Israel Aerospace Industries Ltd. The Heron TP can fly at 45,000ft-high. Image courtesy of Israeli Air Force. A 1,200hp turboprop engine powers the Heron TP UAV. Image courtesy of Israeli Air Force. The Heron TP unmanned aerial vehicle has a wing span of 26m. Image courtesy of Israeli Air Force. The Heron TP can be equipped with M-19HD electro-optical payload. 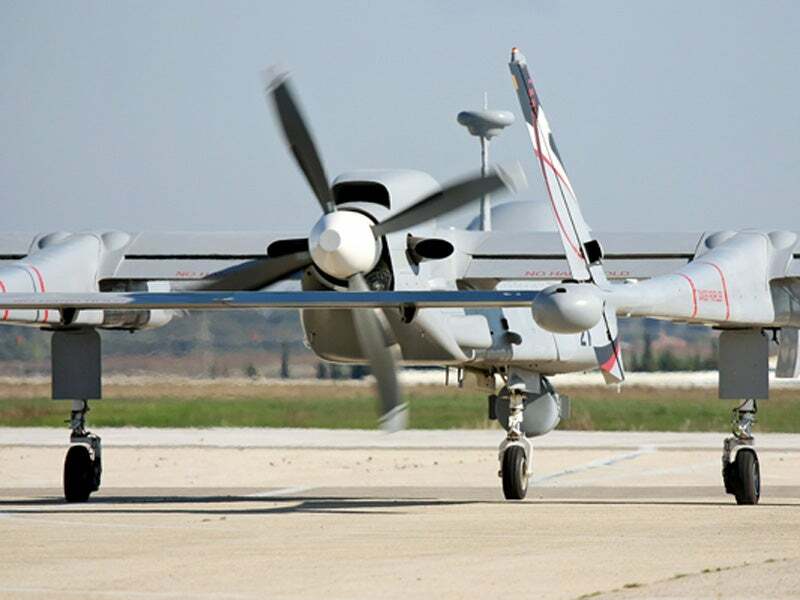 Image courtesy of Israel Aerospace Industries Ltd.
Heron TP (Eitan) MALE (medium-altitude, long-endurance) unmanned aerial vehicle (UAV) is an advanced variant of the Heron 1 UAV developed by Israel Aerospace Industries (IAI) to meet multiple mission needs of the armed forces. The Eitan MALE UAV’s mission capabilities include surveillance, reconnaissance, battle damage assessment, target acquisition, aerial refuelling, intelligence gathering, and missile defence. A full-scale prototype of the Heron TP was displayed during an event that took place in Berlin ExpoCenter Airport in June 2016. IAI’s MALAT Division unveiled the Heron TP unmanned aerial vehicle during the Paris Air Show held in June 2007. In June 2008, IAI and Rheinmetall Defence Electronics (RDE) entered a co-operation agreement to offer Heron TP for the SAATEG intermediate solution of the German Armed Forces. A number of Heron TP drones were inducted into the White Eagle Squadron of the Israeli Air Force (IAF) in February 2010. One of them was crashed during a test flight in January 2012. The Indian Government approved the purchase of ten armed Heron TP UAVs for the Indian Air Force in September 2015. In January 2016, Germany announced its decision to lease up to five armed Heron TPs as an interim solution. The new UAVs are expected to enter service in 2018. The 14m-long, Heron TP MALE unmanned aircraft system (UAV) features an all-composite airframe with high-wing cantilever monoplane design. The main wings, spanning 26m, have high-aspect ratio. The UAV also features twin-boom configuration, where booms are extended from the wings to form the tail structure, consisting of two tails connected by a single tailplane. A pair of vertical tail fins is mounted at the ends of the tailplane. The retractable landing gear is arranged in a tricycle fashion with two main units mounted under the tail booms and a nose wheel under the fuselage. With a large internal volume, the UAV can carry various payloads weighing 1,000kg. The Heron TP design can also be adapted to a variety of missions. The drone features triplex redundancy in all avionics for reliable and easy operation. Its safety is further increased by dual automatic take-off and landing (ATOL) system. The EO / IR / LRF electro-optical targeting system, carried under the fuselage, incorporates infra-red and daylight cameras that provide real-time vision of the battlefield under all lighting conditions. The payload pod, also comprising a laser range finder, provides surveillance, reconnaissance, targeting and distance measurements. "The Eitan MALE UAV’s mission capabilities include surveillance, reconnaissance, battle damage assessment, target acquisition, aerial refuelling, intelligence gathering, and missile defence." The Heron TP’s mission systems include maritime patrol radar (MPR), electronic support measures (ESM), electronic and communications intelligence (ELINT / COMINT), and synthetic aperture radar (SAR). It can also be installed with M-19HD multi-sensor electro-optical payload. The real-time imagery and telemetry data collected by the payloads are transmitted to the ground control station using line-of-sight propagation and satellite communications (SATCOM). The UAV allows for simultaneous operation of different payloads for multi-mission requirements. Powered by a 1,200hp Pratt & Whitney PT6A-67A turboprop engine, the Heron TP MALE UAV can fly at speeds of approximately 200kts and can reach 45,000ft above commercial traffic. Mounted at the rear of the fuselage, the engine drives a four-blade propeller, which is arranged in pusher configuration. The drone has a maximum take-off weight of 5,300kg and is capable of enduring for up to 36 hours in all weather conditions. It can transmit data at beyond-line-of-sight (BLOS) range using SATCOM.